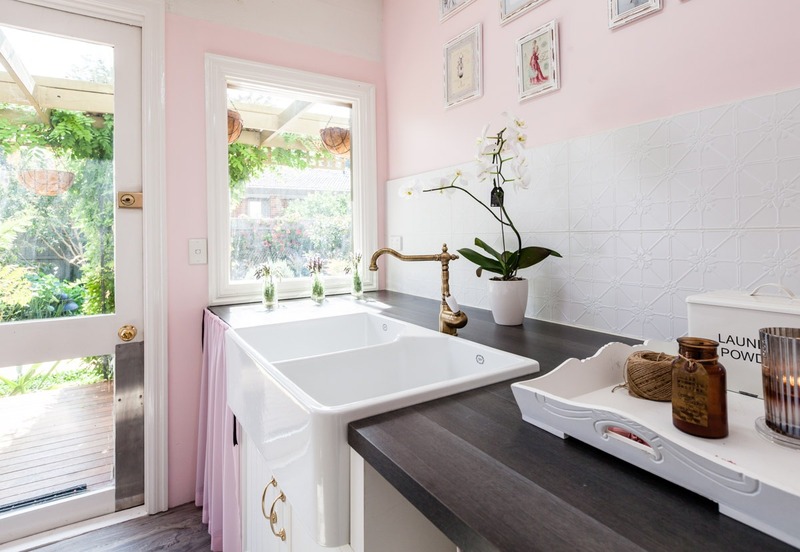 Christine wanted to refurbish her tired 1980s styled laundry into a modern Victorian country laundry and sewing room. She wanted this space to be a haven, her ‘happy place’ where she could spend her days in the morning sun sewing for her grandchildren or clothes for herself. 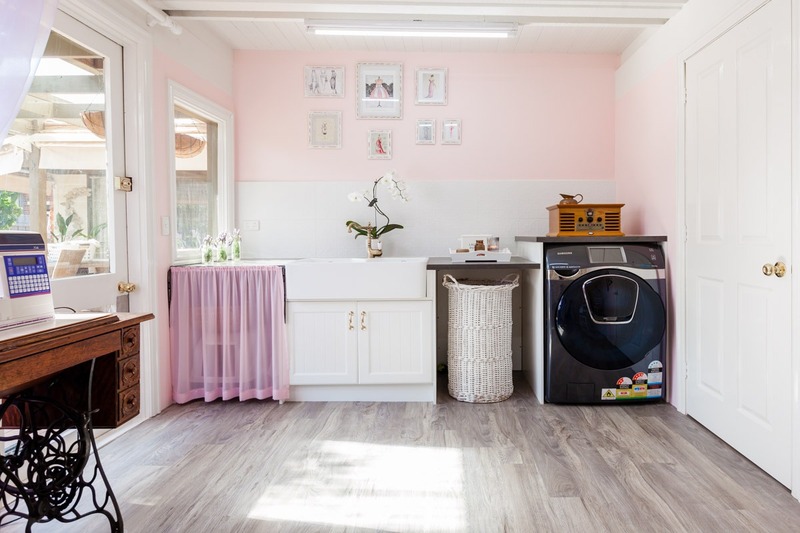 As a high functioning space the laundry had to be practical and make laundry easier as well as durable given it’s the exit/entry point to the backyard, it also had to be easy to clean and maintain and well organised with ample storage. Christine’s laundry needed a complete refurbishment. When we started this project the laundry was dated in style and colour, had some wear and tear from many years of service and some damage caused by pets. The room also needed a massive clear out of items not relevant to the purpose of the space such as CDs. Our brief process was thorough and we understood what Christine wanted in terms of functionality and style. For the laundry we delivered a streamlined area full of storage and lots of bench space. 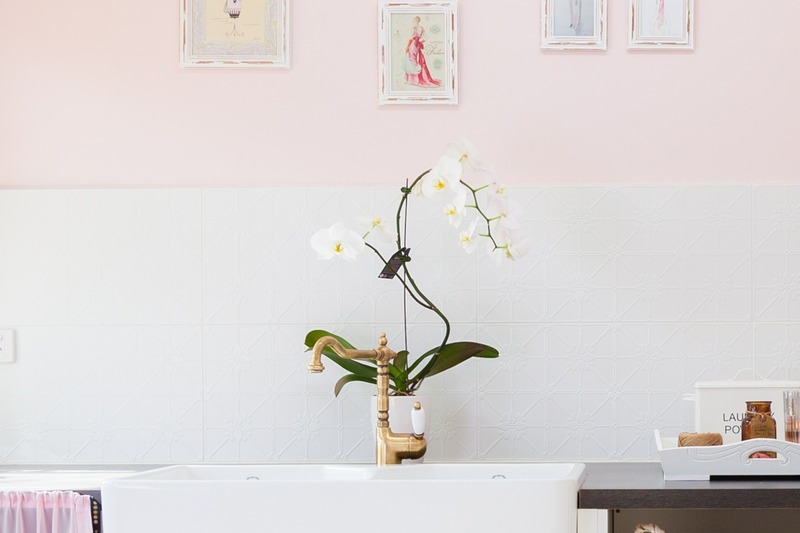 A key practical solution was to specify one appliance to wash and dry rather than two, which overfilled the room, and made the space feel congested. We created a space for the laundry hamper and kitty litter so that everything had its place. 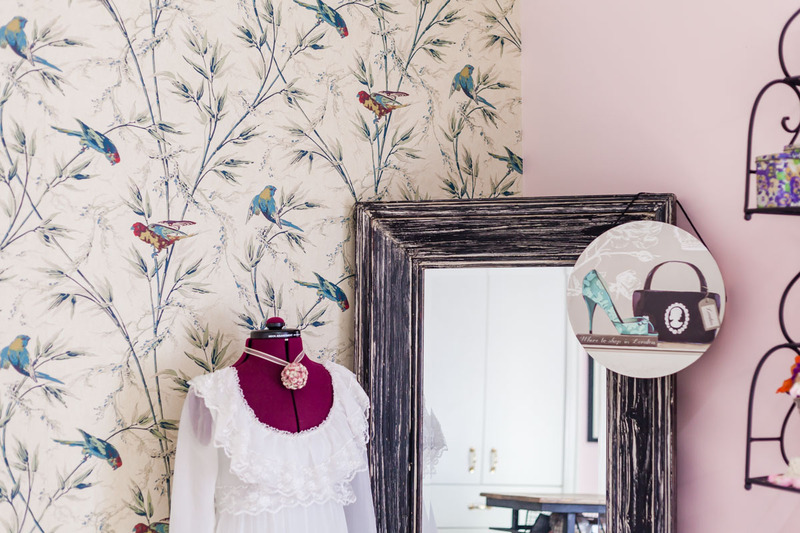 For the sewing room functionality we focused on the Victorian Country Style Christine loved so much and specified a gorgeous wallpaper from London with significant historical value in a bird motif, found in other areas of Christine’s home. 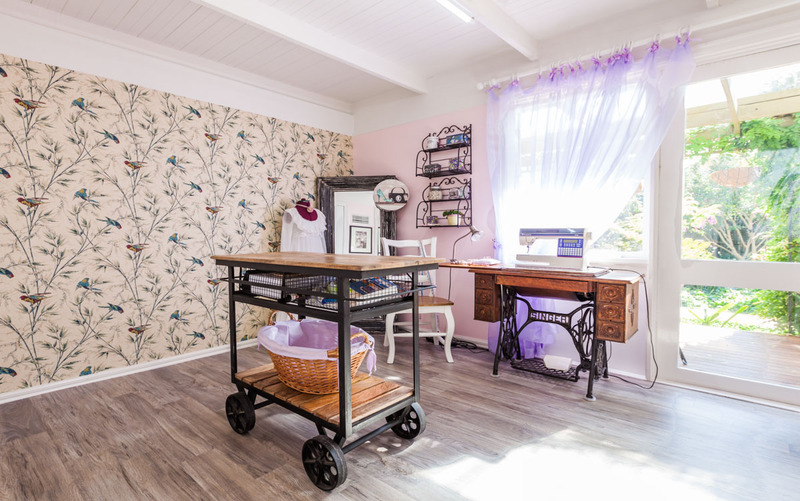 We found a stunning refurbished industrial style trolley for Christine to cut fabric and store items for sewing and the large laundry baskets, which worked beautifully with Christine’s old Singer sewing machine in terms of material, textures and colour. 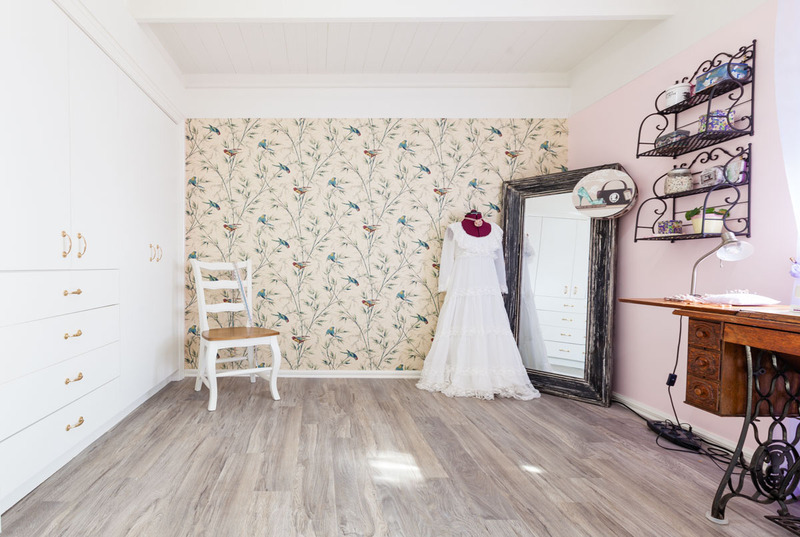 We also gave Christine some creative ownership of the space and directed her so that she could make the curtain and configure prints on the wall from old patterns. The end results was a deeply personal space, a haven, where Christine can sew to her heart’s content and undertake the laundry chores effortlessly. 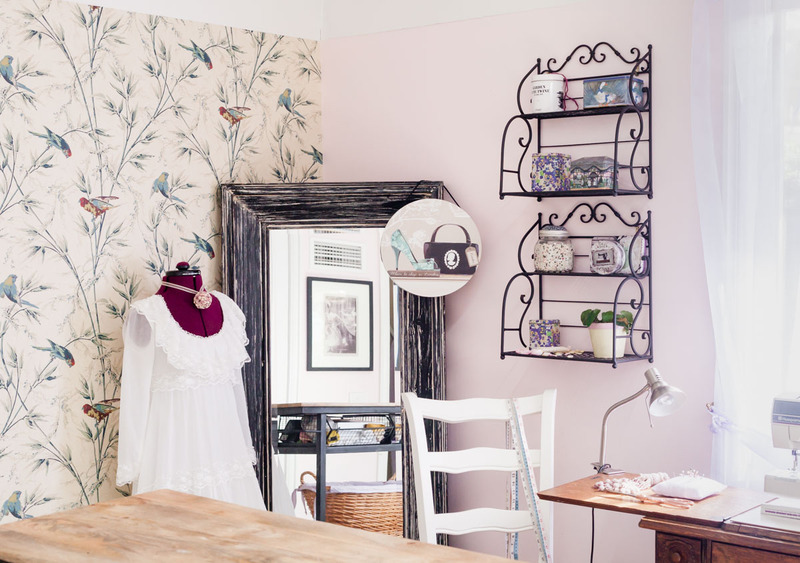 “All I can say is thank you Trish for reinventing my “happy place.” My laundry/sewing room is basically the hub of my life and it was looking very, very sad. It was no longer “happy” but I was at a loss as to what do with it. So, I decided to call in a professional….and that’s exactly what I got when I found Trish & her company Grace Interior Designs. From the outset, I liked Trish and ideas about bringing my “busy room” back to being a delight to work in. The process was thorough, Trish got inside my head to understand what feel did I want, colours, practicality, functionality, configuration etc. Once all that was considered and reconsidered and reconsidered the tradies moved in and got “cracking”. There were times when I thought I didn’t like the wall colour or the wallpaper but as I later learnt one must be patient. When it all came together it was perfect!! I have a most gorgeous room in which to sew, craft and do laundry and my cat is very happy with her new living quarters. As part of my brief Trish had to accommodate my cat, her bed and kitty litter in this beautiful room and did it with style.